I discovered two things last week. One was Reeces Pieces, which are delicious, and available in milkshake form. The other Was Rosie Thomas, who isn’t, but is just as tasty. I have no idea where I acquired Iris and Ruby from, but it is definitely second hand and doesn’t has a price in the front cover so I’m guessing either a book swap, or PovAid. Wherever it is from, it’s been on my shelf for yonks and I’ve nearly read it a few times, before passing over to something else. Another one of those dual narrative historical/modern novels that have been the only things you could bloody read for the past ten years, this is a good example of how to do this genre right. It gets the generations sorted properly, and the characters reflect their generations. Ruby and Iris couldn’t be more different. Iris of the forties reflects her upbringing of a middle class, intelligent, highly educated 22 year old who is used to living away from home, who takes on a job in Cairo working for the military during the war. Ruby, the modern stubborn19 year old, is still recovering from a frankly horrible adolescence including (that doesn’t get resolved to my satisfaction to be honest) being abused by her uncle. Iris, after a life time looking after others at the expense of a relationship with her daughter, has returned to live out her old ago in Cairo. Her memory is fading and she is frightened and lonely, living a sheltered existence with her housekeeper. Ruby, fleeing her life in London and her interfering mother, runs away to Cairo on a whim and throws herself on the mercy of her grandmother, whom she has not seen in years. The two soon become fast friends, and Ruby encourages Iris to tell her her memories of the war and her great love affair with Xan Molyneux. At the same time, Iris eases Ruby out of her hard city girl shell and she begins to discover life can be wonderful without drama and hardship. The two have many adventures together, and the book is a little all over the place, but it is a lovely, lovely read. The romance between Iris and Xan is very well done, and contrast nicely with the more modern straightforward affair between Ruby and a local man, Ash. In fact, this book is best read as an exploration of the differences between Then and Now, the heady days of British influence in Cairo, and the more modern city, where tourists abound and people live in the tombs of their families. The book is also lovely in showing how families can drift apart,. but how sometimes that isn’t a bad thing. Ruby’s mother and Iris’ daughter Lesley has her own journey that reflects that of many middle aged women-not wanting to let go of their children, unable to contemplate a life of their own without working towards the needs of others, be it a child or a man. I liked Lesley an awful lot and her subtle shift from frantic career mother and doting wife to strong independent person who will wear whatever damn trousers she chooses, was one of my favourite parts of the book. All is all, I am so pleased I read this book. 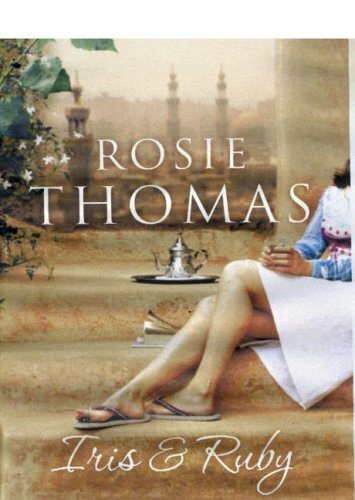 I’ve read another Rosie Thomas since then, and passed this one on to my G-Ma. If you like romance, dual narratives, comfy writing and a bit of drama, you need to get into her books. She is a fascinating person herself as well, which always helps!